There are so many awesome ways to take care of our Earth these days, from recycling to Hybrid cars. My favorite though is still to plant a tree, with help from a friend, of course. So many of my story ideas have come from time spent staring out into the forest behind the house, day-dreaming about hero's and heroines. What would I do without my beautiful trees? So in honor of Earth Day and this very cool blog tour, I'm giving away a cute little USB flash drive complete with handle and charm. ~my own attempt to save a tree~ The perfect size for our grand prize winner to carry with them their favorite earth friendly E books! LOL...yep these are my ~dream~ lumberjacks!! So tell me, what's your favorite Earth saving trick? Have a great Earth Day and fun with the rest of this blog tour. The Next Address is. Loved your post. I enjoyed the pictures. The one thing that I recycle the most is plastic bags. Seems like that is all the stores give you anymore. I also am enjoying the eye candy. I take my own bags when I shop most of the time. Already recycle and compost and have found some great rechargeable batteries to use in flashlights and remotes. My favorite earth sving trick is reading e-books. I have a kindle and have about 65 books on it. That's just withing the last 9 months so think of the trees we all could save if we read more e-books. Thanks for stopping by everyone! What excellet recycling ideas so far! Becky - lol, I have bags falling out of my under the sink cabinet. Cool thing is, now there are lots of places to recycle them! Debbie D - Yay, Ebooks!! Kindles or any handheld ebook devices are wonderful things! Books at your fingertips ~sigh~ makes a girl, happy, happy, happy! Of course so does showering with the hubby...nice water saving action, Debbie! Love the pictures. I try and recycle everything I can. I am trying to convince my husband we need to plant some trees around the house this spring! I live next to where I was born, with a swamp behind us. We keep the woods as close to nature as possible. Whenever I must move a tree I plant it in the woods and recycle. The woods keep us cool in the summer, we share this earth. I'm so blessed to be able to simply walk back in time whenever I go outside. Debbie T - Awesome way of recycling your trees! You are very blessed to be so close to such beauty! 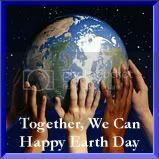 Have a great earth day! Tamsyn - Saving water, trees and ~erhm~ the best exercise ;-), great multi-tasking! Love your dream lumberjacks. I am a huge ebook reader, and can't believe just how much room I've got now that I read less paperbacks. When I do grab a paperback, I always donate it to my local library. Wondering if one of your Lumberjack's and I were to fall down together in the forest, would anyone here??? I but ton's of E-books, Got to save the trees, and I tend to go behind everyone in my house turning of lights. I hope that helps the earth in some small way. Good stuff Serena. Now you can leave Royce alone *wink* and lure Tanner into that shower with you. You suppose they have showers on Earth II? Cathy M - Aren't those lovely lumberjacks ~sigh~ I agree, Ebooks are wonderful! You can save so many in such a small spot on the computer or a flash drive. :-) Library donations..cool way to recycle!! Great pics. I love the "Offer him something different to fell". That's classic! I love trees. We have some gorgeous trees around the house. And some of peach seeds are coming up as baby trees. Savanna - That would do it! Heck, I bet you'd take them both home. Kittens at your Kougar paws!! Ooh peach trees, that would be soo yummy! A waterfall grotto and hay, I have a stunning picture of Tanner going on right now! I may have to wander down to the barn here very, very soon!!! With lumberjacks like that I would be falling for sure.LOL I recycle almost everything possible. I also recycle cloths and household items that we no longer need on freecycle.com. That way it helps the earth and other people as well. Deb - hehe, falling for sure! Nice job on the recycling and thanks for the freecycle web address...that's a cool site! I wish I could say I'm great at doing my part to save the earth ...but I know I fall short. I'd like to think though that the fact that I do recycle whatever I can helps a little.